Veteran hunting guide Jim Shockey blasted Canada officials for lack of action about a growing grizzly problem following the mauling death of a woman and her baby daughter. Shockey has cabins on Einarson Lake, about 400 kilometers northeast of Whitehorse and near the border of Yukon and Northwest Territories. He has trapped, hunted, guided and filmed his television shows in the area for years, including hunts for grizzly bears. 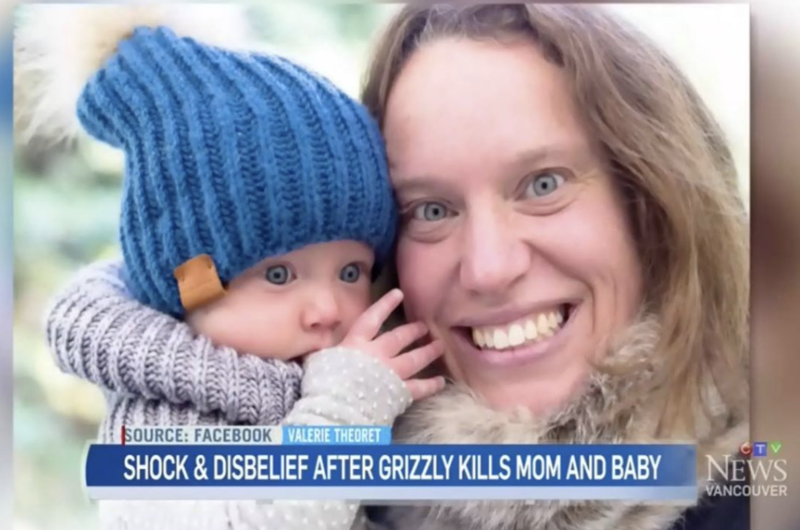 The remote, unspoiled area is where Valérie Théorêt, 37, and her daughter, Adele Roesholt, (pictured in photo above) were killed by the bear on Monday, Nov. 26. Théorêt’s partner and the baby’s father, Gjermund Roesholt, was charged by a bear when he returned to the cabin Monday afternoon about 3 p.m. after running his trap lines. Roesholt was able to shoot and kill the bear. Officials say he then discovered the bodies. The couple and child had been at the cabin for about three months running the trap lines and enjoying time together. In a long, detailed post on his Facebook page, Shockey told of his crew using rifle shots to scare away a grizzly that attempted to break into a cabin. A few years back, you may remember, we aired an episode from this very same Einerson Lake, where one guide had to shoot and kill a grizzly bear as it tried to break into another guides cabin, obviously with the intent to kill and eat the person inside that cabin. The “Rest of the Story” is that my guides shot 17-times, the previous afternoon, around, over and beside that grizzly, trying to haze it away from the camp. And we informed the officials in charge of the highly regulated grizzly bear harvest quotas, that more grizzlies needed to be killed in the wilderness areas, particularly in that “Grizzly Bear Management Zone” that includes Einerson Lake. In fact, I predicted that someone was going to get hurt if something wasn’t done to deal with the grizzly bear plague. Shockey explained how the grizzly quota for hunters is, in his view, far too low for the 4000 square kilometer Grizzly Bear Management Zone that Einerson Lake. Without the limited number of grizzlies that may be killed each season and other restrictions, Shockey said he believes one of his Rogue River Outfitting clients might have been able to kill the bear that attacked and killed the mother and baby. Like two-time Masters champion Bubba Watson unleashing a bombing tee shot, Shockey did the same with those who in his word are "celebrating" the death of Théorêt and baby Adele. Shockey continues, and we recommend you read his entire post if you have Facebook. He presents logical, rational, reasoned arguments from the point of experience in the field and years of interaction with wild game. But that's not all, because as any serious hunter does, Shockey has studied wildlife, talked with biologists and experts, and gathered as much information as he can to end up with his opinions.